CRAFTed is the Crafts Council of Ireland’s Primary School Visual Art based educational programme, promoting learning through creativity by placing crafts people alongside teachers in primary schools. It was brought to our attention by Sligo Education Centre and is funded in part by the Education Centre. Teachers and crafts people met on March 10th, 2012 for a planning day. Teachers outlined the curricular areas hoped to be incorporated into the project and stimuli used to promote creativity. 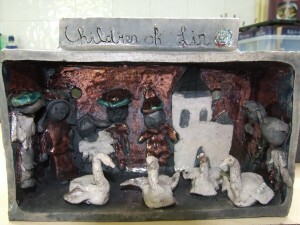 Rachel Quinn, the ceramicist, was the crafts person paired with 3rd/4th class in Ransboro NS. Rachel visited the class before the project started to explain the ceramic process and show the children some of her creations. As a stimulus for the project the children read 10 Irish myths and legends particularly those pertaining to the local area eg. Lake of Tears ( Lough Gill), Diarmuid and Gráinne (Benbulben), Cailleach of Éire (Carrowmore Dolmens) and Queen Maeve and the Brown Bull of Cooley (Knocknarea) etc. They also dramatized the legend of the Children of Lir. The Children had ten contact hours with the crafts person during April and May 2012 to engage in the project. They used clay, slip, modeling tools, rulers, combs and brushes in the creative process. First they made a “me box” which depicted different aspects of their personality. The boxes were measured carefully: the base was 10cm by 8cm, and sides 6 by 10 cm. The boxes were then constructed making a 3D box shape. To make the story boxes they made a maquette (French for scale/model) of the story before actually creating it. In groups of 3 the children depicted one of the myths of their choice. Again they measured slabs of clay to make the story boxes with sides measuring 10 by 15 cm, and a back of 10 by 18cm. They made a net for the 3 dimensional box and constructed the box by cross hatching the over lapping sides with slip to join the rectangles forming the 3d box. 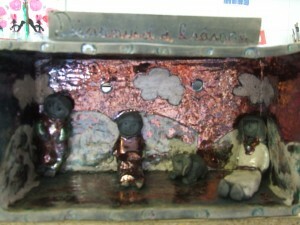 The children created figurines based on the stories they had read and placed them in the story box. Rachel brought the story boxes to her workshop. She placed them in a bisque kiln for 12 hours firing at 1000C. Later the models were painted with a raku glaze and put into a raku kiln for 3 hours. When the temperature reached 1000c they were removed and placed in saw dust to cool. Finally they were scrubbed with a brillo pad and the work of art was complete. Rachel brought them back to school to the delight of the children and they were exhibited in Sligo Education Centre on the June 14th 2012. The children loved the project. For a few Friday afternoons in Spring 2012 the 3rd/4th classroom was transformed into a potters workshop with children blissfully happy engaged in mathematics, history, geography, art, literacy and numeracy while creating ceramic story boxes. This truly was a cross-curricular and wonderfully collaborative project and the children were privileged to be a part of it. The completed story boxes now adorn the entrance foyer of the school where they take pride of place for all visitors of our school to admire.